Muppet Peter Pan #2:I saw that Boom put up the cover for the 2nd issue of Muppet Peter Pan. I still am having a really great time doing these covers and I'm thrilled to be able to draw the Muppet characters in all these locations/costumes/story scenarios. "Thanks Boom! I'll keep drawing them as long as you will have me!" For this cover, I was happy to flourish up Gonzo as Captain Hook. Gonzo is my favorite Muppet, so I take even more pleasure in drawing him. I thought about having the feather in his hat be the tail feathers of a chicken that sat on his head under the hat...but I decided to go more traditional (and since I don't think that's in the story it was just embelishment for my own glee) However, note the chicken motif on the ship's railing and the pommel of Gonzo's saber. 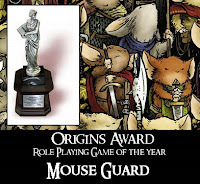 Mouse Guard RPG wins 2009 Origins Award for best Role Playing Game!! Luke Crane did a wonderful translation of my Mouse Guard world into a playable and fun game. He and I talked early on that the game had to be something more than just an RPG where you happen to be mice, one that really took the scale and the lifestyle of my characters and made the mechanics focus on it. So thank you Luke! And now it has won RPG of the year 2009 upsetting Dungeons and Dragons 4th edition. Even though Mouse Guard uses only 6 sided dice, I think it just rolled a natural 20. I am excited about the use of social networking and its relationship between fans and creators (being a creator who also is a fan of other creators). 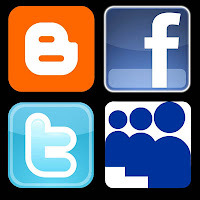 I now use Myspace, Facebook, Twitter, and this Blog (and that's not counting regular ol' e-mail.) I want to invite all of my fans to use the Blog, MySpace, and Twitter to keep in touch and connect/comment/question/compliment/or complain. However, I'd like to keep Facebook as a more personal site for friends and family I know personally and keep in touch with. I'm not trying to complain here, I just want fans to know that if I have ignored a Facebook request it's not a snub, just please contact me through one of the other venues. A few posts back I mentioned how Walter Harris did a great job on his Mouse guard action figures he made from Ewoks. Well, he's been at it again and now has 3 'waves' (1: Saxon, Kenzie & Lieam. 2: Sadie, Celanawe, & Midnight. & 3: Rand, Conrad & Gwendolyn.) Take a look at his site for detail photos of all the characters. Thanks again Walter! Runner Ups: Bree Smith, Geoffery Wong, Sharon Wong, Brandon Klassen, & Nick Nemphos. Has Rand ever killed a Snake? No. What does the inscription read on the compass lid of Loukas’ sword? What is the motto above the door in Gwendolyn’s office? What did the mice use to mark the grave of the grain merchant? What type of bed does Celanawe use? How many of Midnight’s army were left outside the gates of Lockhaven? In the game Saxon and Kenzie play in the Casks, which mouse is apparently winning? What poison was found in Rand’s leg bandage? What inscription is over the door in Lockhaven’s Cookery? What baked good is Lockhaven known for? Guy Davis, Rick Cortes, Mark Smylie, Jeremy Bastian, Geof Darrow, Stan Sakai, Craig Rousseau, Nate Pride, Jane Irwin. *Several places I refer to Lieam having joined the Guard in the Winter War of 1149, however, I found that the RPG has a misprint that says he joined 2 years ago...taking into consideration that the RPG is set up in the same time as the comics thus far (1152), the match comes out to be 1150, which I also accepted. **The city names were the biggest trip-up for the entries. More people got this wrong than any other, and it came down to spelling. I felt bad at first that the map's text, which is handwritten, was hard to read with the strikethrough, but I found that the cities are listed in the printed text of the RPG and 2 of the cities are printed in dialogue in Winter #1. ***Another one I didn't expect to get more than 1 answer to consider correct. Glen Stone was submitted and I had to accept it. While I hadn't ever done much with it other than place it in the song lyrics (not even having decided if it were real or fictional), the reality is that it was mentioned and is therefore also correct. Paste the questions & answers into an e-mail and submit them to ericebon (at) hotmail.com. The answers should all be available in the Fall Hardcover, the Winter issues, the RPG, this blog and or various online interviews. The contest will be open for 1 week. Entries must be recieved by 6-19 at 12:01 AM (EST). Correct answers will take priority over speed, but speed may be used in the event of a tie. First place: 2 six foot long Mouse Guard banners (my former convention banners) AND an original piece of Artwork. 5 Runner-ups will recieve: A Mouse Guard poster and buttons. Who was the 4th matriarch of the Guard? Based on the RPG, what is Kenzie’s birth year? When did Lieam join the Guard? Who is the character Saxon based on? Who is the character Lieam based on? Who is the character Kenzie based on? Has Rand ever killed a Snake? How many different swords have we seen Lieam use? What was Landra’s job prior to taking over for Rand? What city is the Easternmost on the Mouse Territories map? What three cities are listed as having fallen on the map? What city is mentioned in the story, but not shown on the map? Where was Sadie stationed prior to the Fall of 1152? What series & issue shows a mousey Han & Luke? What is hidden amongst the bones on the cover of Winter #4? When (year) do I date the first Mouse Guard drawings? What was the company I used to publish the first black and white issue of Mouse Guard? To whom is Fall 1152 in loving memory of? Here are the covers for Muppet Robing Hood #4 and Muppet Peter Pan #1. The Robin Hood cover was in some ways an homage to Disney's Robin Hood...it was the narrator in the Disney film, but with Kermit's connection to the banjo, I thought it was fitting. 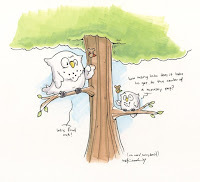 I have mentioned in previous posts that I wanted to do a contest for the blog and for the fans. So here is how it will work: I will be posting a list of trivia questions at 12:01 AM on June 12th. e-mail back the answers....it will be as easy as that. The prizes will include: Original Mouse Guard artwork, My old 6' show banners, a set of sketchbooks, and signed books and posters. So check back to enter (and for further rules. I'm not able to post much artwork, but I'm getting into the final coloring stages for Snowy Valentine's Day. The publisher was drawn to my Wind in the Willows illustrations where I used fabric textures for the clothing on the characters. Julia and I went to a fabric store and spent a good hour just snapping photos of patterns and textures we thought would be helpful. I'm trying to wrap the interiors up this weekend, otherwise the book could be pushed back a year! (book publishing schedules are set way in advance and since SVD is a holiday book, if we miss the window for 2011, it goes to 2012). The first Ink and Stein was a huge success!! We had a larger turnout than we expected, got folks in for the local area and even brought in a few from the Lansing area. We had a few writers show up, which we hadn't planned on, but I was pleased they came. The whole idea is to get creative people around each other talking about and working on creative things. If Ink and Stein can bring writers and artists together to collaborate on ideas or help each other with their thought process, I'm all for it! Katie Cook drew this a while ago, but I saw it again at the Motor City con and thought I'd post it. Thanks Katie!! !